It has a lovely bouquet: nectarine, a hint of praline, lanolin and a hint of walnut that gains more and more delineation with time. The 2016 White Blend is a blend of 60% Chenin Blanc, 30% Verdelho and 7% Viognier with 3% Chardonnay. The 2016 includes a new addition to the blend in the form of a new schist vineyard to complement the decomposed granite soils (the vineyard also includes Syrah that will be bottled separately from 2017). Also, it is the first white blend under 14% alcohol. It has a lovely bouquet: nectarine, a hint of praline, lanolin and a hint of walnut that gains more and more delineation with time. The palate is beautifully balanced with a fine line of acidity, just a hint of praline once again on the back palate, nectarine and white peach towards the poised finish. Drink 2017-2030. 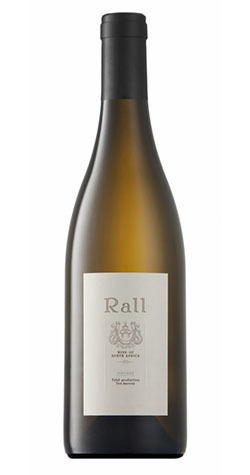 Rall wines was established in 2008 and is owned and run by young independent winemaker Donovan Rall. After graduating with a Viticulture and Oenology degree from Stellenbosch University in 2005 and extensive travels and harvests all over in the next few years, Donovan returned to SA in 2007 for a season in the Swartland. Here he found his inspiration for the Mediterranean varietals and the dream of making these unique and natural styled wines under his own label from these scattered old vineyards was born.